Section 5004.1 of the California Motor Vehicle Code is a “Year of Manufacture” (YOM) law that allows vintage cars to be registered to use vintage license plates. Several other states have YOM laws. Check the details for your state which are very likely to be different than California’s. For example, in California a YOM plate is effectively the same as a “vanity plate” and there is yearly fee for it in addition to the regular registration. Because you are paying “full fare” on registration the state places no driving limits (but your collector car insurance company might). I ran into a couple of snags getting my California YOM plates so I wanted let you know how to avoid the problems I ran into. What cars can use vintage plates? The California YOM law has been recently revised and now extends to 1969 and earlier cars (1972 and earlier trucks). The plates must be for a year that matches your model year. If you have a 1951 model year vehicle that was built and originally registered in 1950, you will need 1951 plates. If the plate year is one where a bolt on metal tag was applied to an earlier plate, then you will need the earlier plates and the bolt on tag. This did not apply to my car so I am not really clear on these details. You will need a pair of matching plates. Single, unmatched plates will not do. The numbers on the plates cannot already be in use. New plates were issued every year for a while. 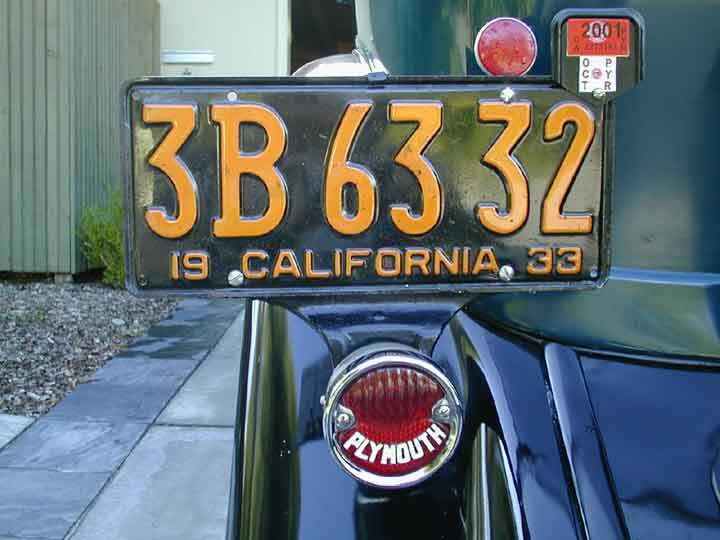 If someone has already snagged a number for their 1938 and your 1936 plates have the same number then you are out of luck. Also, some years the plate numbers used sequences that match that of currently registered motorcycles. Make sure your plates are “cleared” (i.e. not in use) by the DMV before you buy them. You can contact the DMV to see if a set of plates is clear. Their number is 1-800-777-0133. Dial 1 to get English, then 0 to get an agent. The 800 number agents know of the YOM law and can quickly check to see if the number is in use. There are license plate collectors and clubs that may be able to help. Some of the collectors are also dealers. There are usually plate dealers who show up a automotive swap meets. If you buy from a dealer at an automotive swap meet they should be able to guarantee that the plates will clear with DMV. If you buy from a private party you will have to clear the plates yourself first. eBay has a section on license plates. I found that I could get a lower price on eBay than I could from a dealer. It just took several weeks of watching until a set that looked in good enough shape with numbers that cleared DMV to come up. AAA can do a lot of things for you, but they would not do a YOM plate registration for me. Apparently a visit to the DMV is the only way to make the transaction work. I have been informed that the vehicle must be currently registered and apparently a non-op status does not count. So you may have to officially make your vehicle operational. The YOM plates you wish to have registered. A check or $45 in cash. Allow a long time at the DMV. The clerks do not do this transaction very often. You will probably end up with one who has never done it. It will take time to look up form number 352, and to look up the procedure in the loose leaf binder. When you leave the DMV you will have your YOM tags and a window sticker to show temporary registration. The DMV will keep your previously registered plates and, in my case, the pink slip. You are not allowed to mount the YOM tags on the car until you get a metal adaptor plate and current registration stickers in the mail from the main DMV office in Sacramento. I left the DMV feeling I'd never see my title again and wondering if all the forms had been filled out properly. Once processed, you will get a metal piece to bolt on to the rear license plate. This metal piece is for the registration stickers that are in current use to show the vehicle is properly licensed. In my case processing took just a little under three weeks. And I did get my pink slip back. By the way, the bicycle reflector attached to the license tag is to comply with section 24607 of the California Vehicle Code.